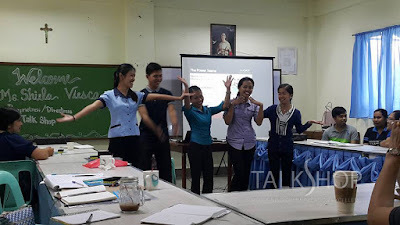 Teachers from St Dominic de Guzman School reaffirm their passion for their vocation and love for their students as they engage in confidence building and effectiveness training in TalkShop’s PersonalityDevelopment workshop. This TalkShop seminar has helped me a lot and prepared us for the first day of school. It is a great tool to be an effective teacher for the whole year and the following year also. I am hoping to have another seminar with TalkShop on proficiency in English. I learned many things that I am sure are very helpful for me as a teacher. I learned how to talk to parents in a good way. This seminar helps me to develop my grammar, posture, reading skills, and my overall professionalism. I like most in this seminar how to introduce myself to my students and to give feedback to their parents. Ms. Sheila Viesca discussed and demonstrated the activities well that’s why we can participate in all activities. To be a good and effective teacher in every word we speak and gesture that we show is the transformative effect of this workshop. I learned to use the right words, pronounce them, and employ the power of confidence to face our students and also the parents. The program develops confidence and grammar. This workshop helps us to be better a person. Ms. Sheila is the most amazing, generous, and approachable facilitator that I met. Talkshop workshop helps me to be confident and to realize that effective communication is important. I know that I can communicate well, however, I admit that there are some instances when I can’t express my feeling, ideas, and suggestions. So to improve, I will encourage myself to study on how I can communicate best. 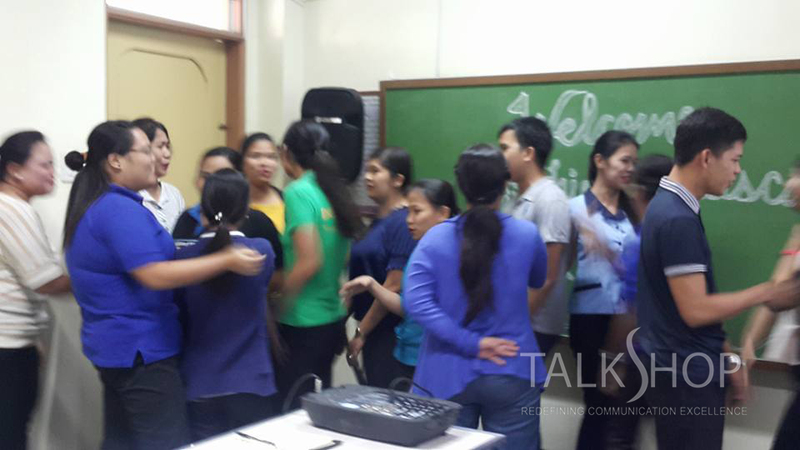 The Talkshop workshop is very helpful most especially to us new teachers. The part that I like most is when the Facilitator taught us how to greet properly. It is very important as what the saying goes, first impression lasts. Ms. Sheila is very effective. TalkShop workshop prepared me for the school opening and beyond! Firstly, I feel so blessed to attend a seminar like this. When I found out that there are presentations, I got nervous. However, when I enjoyed the seminar, the nervousness vanished and I gained confidence in presenting with colleagues in the group. I learned a lot from the Talkshop Workshop. It is fantastic. The area I liked most is pronouncing of the alphabet where we go round and shake hands with one another. Ms. Sheila is beautiful and talks impressively. Because of her, I gained confidence in communication. TalkShop program design is excellent. The part that I like most was when we make our cheer and present in front. TalkShop is the best training institute for Personality Development. Thanks Ms. Sheila! I cannot explain how much I learned today. My day is very good because of the talk of Ma’am Sheila. God bless you! The program design is great. I like the singular /plural verb. Ms. Sheila Viesca is excellent. I need to learn more to become effective in communication. I learned a lot from Ms. Sheila – from grammar to public speaking. The program design suits the needs of the teachers. Ms. Shiela VIesca has a very pleasing personality and she is also a good Speaker. The TalkShop workshop helped me overcome my anxiety of public speaking. I’m very glad to attend this seminar with you, Ms. Sheila. I enjoyed the activities very much. However, some of those activities made me nervous. I learned a lot - especially the ABC activity. I learned a lot of information that we can apply in teaching. I love the activities that we encountered in this seminar. Ms. Sheila is very good in giving the tips in spoken communication. I can apply them all when teaching. All topics are very interesting and I learned a lot. I learned a lot most especially on how to be an effective communicator to the students and parents. The program design is good for us and a big help for me. Ms. Sheila is confident, beautiful and she is very good when it comes to delivering her lessons. I think for the transformative effect that Talkshop did for us is to be more confident to talk the children and parents. Thank you for sharing your knowledge to us and for coming to our school without hesitation. Thank you and God bless you always and your family. Every time we have a seminar from Talkshop, I learn a lot. This seminar gave me more knowledge and also increased my self- confidence. I’m glad that there is a Talkshop seminar to help develop our confidence and effective communication when dealing with everyone and talking to the students and parents. Ms. Sheila is a beautiful and inspiring Speaker. All of us are interested in her next topic. 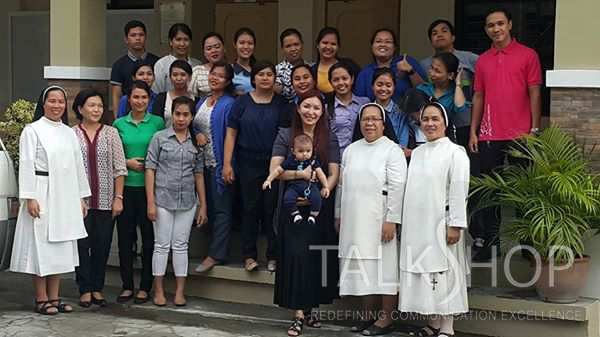 Increase in self- confidence is the transformative effect this TalkShop workshop did for me. The TalkShop workshop is very interesting and enjoyable. I hope to see you again for more training. I learned how to communicate with parents and to have confidence in facing the crowd. The program design is very informative and interesting to the participants. I enjoyed facing the audience and reading in front of an audience the most. Ms. Sheila is very informative. She has mastered her topics and delivered them very well. The workshop boosted my self-confidence and helps my grammar. I learned a lot from TalkShop workshop. I felt nervous at first because I’m not so good at speaking in English and when the workshop started, I felt wonderful most especially in the ABC exercise. The whole seminar t is very good. I really learned a lot from your talk. Ms. Sheila Viesca is a very good model. I really admire her for being sophisticated as she stands with full confidence as if she owns the stage. The workshop transformed me to be confident in expressing myself as I stand in front of other people. I will speak English constantly to improve my communication skills. Believing in ourselves as we do thing our work is what I have learned personally. The SVA and some misconceptions on the use of is and are, and even those special nouns. I love all that we did in this program but what I like the most was when we were given the chance to speak in front one by one. Ms. Sheila is very good. Her positive approach three years ago did not change. I love how she encourages us and very careful with her word whenever she gave corrections. She has always inspired us to be open- minded and confident as we teach our students and face the parents. I learned a lot from Talkshop workshop. I really enjoyed it. It is nice to meet and see you Ms. Sheila Viesca. Thank you. I learned a lot. It refreshed me for the coming school year. I learned a lot from this Talkshop workshop. I like when all the teachers participate in vocalization. Ms. Sheila is really good, smart, and beautiful. The workshop enhances our skills and corrects us on how we are going to read and use the words correctly. I am going to talk to the parent that his child is good in some academic aspects. However, the child is not so good in a particular area that is why he got a lower grade and I will recommend to the parents that they give effort to teach their child at home and as the adviser, I will do the same in school. I learned that communicating skills are important especially in my profession. It could make or break the listeners depending on what I deliver to them or how I communicate with them. The TalkShop program helps us to correct our wrong doing in communicating with people like parents, students co- teachers or even the administration, and staff. Ms. Sheila is good she knows what we need to know for us to improve our communication skills. I improved my confidence to speak in English. Thank you! Ms Sheila, maraming salamat po sa Talkshop seminar sa mga binahagi ninyo po sa amin. Salamat po sa mga aral. Sobrang galing ninyo po at sana po hindi kayo magsawang bumalik sa aming paaralan. Maraming salamat po dahil kahit po saan ito ay aming babaunin. I learned a lot from this kind of workshop, especially in English .The program design is well - done. The area which I like most is the ABC because I know all of the teachers enjoyed it. Ms. Sheila Viesca is very energetic and proficient. She’s the Speaker / Consultant that I like most because she is not boring and cannot be forgotten. The transformative effect that Talkshop workshop did to me is to make me aim to be a more effective teacher. It is a very good seminar and I think I’m ready for school year 2016-2017. The program design is very good. Kudos TalkShop! Way back then, I was afraid to share what is on my mind because I did not want people to judge me if I was wrong, now I’m still afraid but little by little I’ll do my best to overcome that fear. I want to share my ideas with others. I’ve learned a lot from this TalkShop experience – from the proper posture, proper pronunciation and rapport-building with the students and parents. The program helps me a lot to look at my vocation in a positive way. Ms. Sheila is very accommodating and knowledgeable. The workshop enhanced my beliefs in teaching. I thought teaching was so hard. Well, it still is, but when we know how to cope with the different students’ personalities, teaching is fun. In every interesting activity we did with Ms. Sheila, we learned new ideas. Because of this kind of seminar, we fully improved our skills in helping our students and parents to guide their children. I’m very thankful that I am one of the participants in this seminar. I learned a lot. I like that every individual participated in the activities. Ms. Sheila is very good and nice in giving advice on any situation that we will encounter. This workshop helps me to be more confident. TalkShop’s positive communication approach helps us to gain more knowledge and have good skills to socialize with others, especially the parents. For example, if your student finds difficulty in memorizing and analyzing, give him an option by guiding him in what he is good at. I learned a lot especially the ability to have more confidence in teaching, speaking, writing, and talking to others. The program design is good and it helps us to be productive and helpful teachers. The Talkshop Consultant, Ms. Sheila Viesca helps us to build our confidence and to be equipped when teaching our students.